Every great town deserves a great park. And now, after much anticipation, our town of Fethiye can proudly boast that facility. 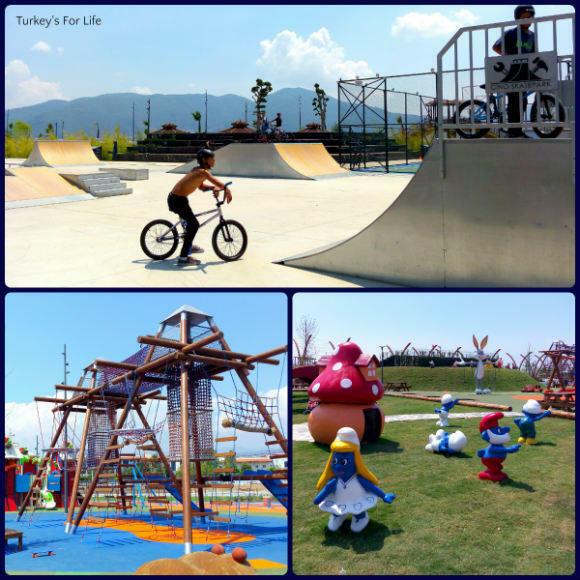 Şehit Fethi Bey Parkı was opened on 26th July 2018 and it’s a park that offers something for everyone; adults and kids alike. There’s a bit of quirkiness about it which reminds us of Kent Park in Eskişehir, and, once the gardens have matured, there’ll be the more traditional park-feel to it, too. Not only that, it is also described as ‘the region’s largest recreation area.’ Get us, with our already famous park. 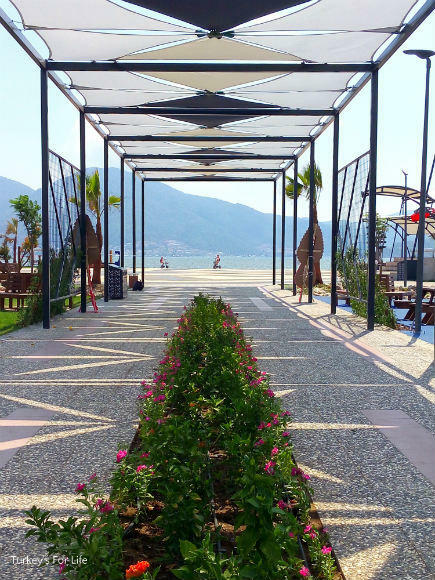 If you follow our monthly Fethiye news updates, you’ll know we’ve been following progress of the park – and the whole length of the harbour for that matter – for some time. Last August, when the boardings finally went up, a council notice put completion date at 333 days. That meant Şehit Fethi Bey Park should be completed by July 2018. Throughout the wet winter, we watched as diggers ploughed their way through sludge, digging canals and heaving decorative rocks into place. As July approached, each time we walked past the park (an almost daily occurrance), we couldn’t believe how quickly progress was being made. Teams worked into the night to make sure the main area was going to be ship shape, ready for the grand opening. And they did a remarkable job! Who Was Şehit Fethi Bey? 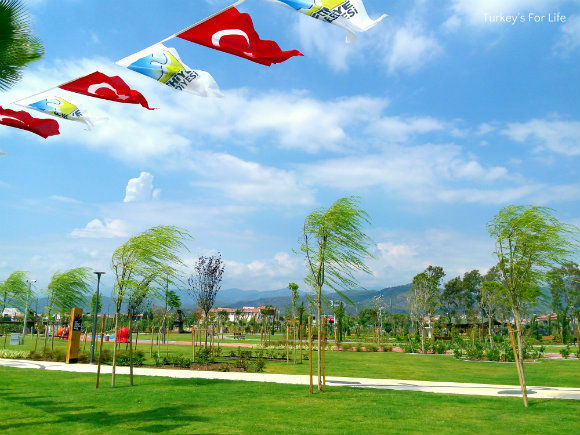 So, why is Fethiye’s new park called Şehit Fethi Bey Parkı? 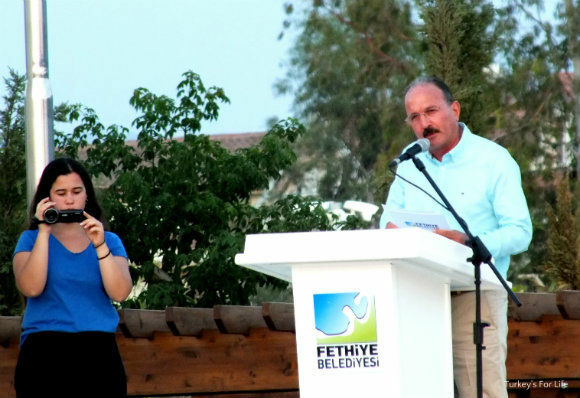 Well, did you know that our town of Fethiye is named after Şehit Fethi Bey? Fethiye is the feminine form of Fethi. Tayyareci Fethi Bey was an airline pilot and was originally from this region. In 1914, he attempted to make a flight from Istanbul to Cairo in Egypt for the first time. Unfortunately, on February 27th 1914, his plane crashed between Damascus and Jerusalem and he received the title of the airforce’s first aviation martyr (‘şehit’ means ‘martyr’ and is the phrase used for fallen military personnel). Previously known as Telmessos and Makri, in 1934, the town’s name was changed to Fethiye in honour of Şehit Fethi Bey. 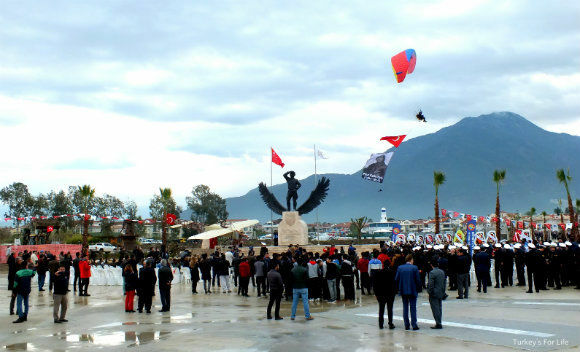 Every year, on the anniversary of the death of Şehit Fethi Bey, commemorations take place at his statue with members of Turkey’s Aeronautical Association in attendance and performing air displays. The statue is now housed in Şehit Fethi Bey Parkı and is a focal point with space and seating for public gatherings. Very fitting for he who the town of Fethiye is named after. Okay, so now we know what’s in the name (of both town and park), let’s a have a wander around Şehit Fethi Bey Parkı. A place that is surely going to be a top attraction for locals and visitors in the coming months and years. The photo above was taken in winter – as you can no doubt tell – and that was our first opportunity to have a peek at how things were shaping up with Şehit Fethi Bey Parkı. Since then, the landscape design and other facilities have changed the face of the park and it has already become a favourite place to take photos with both phone and camera. 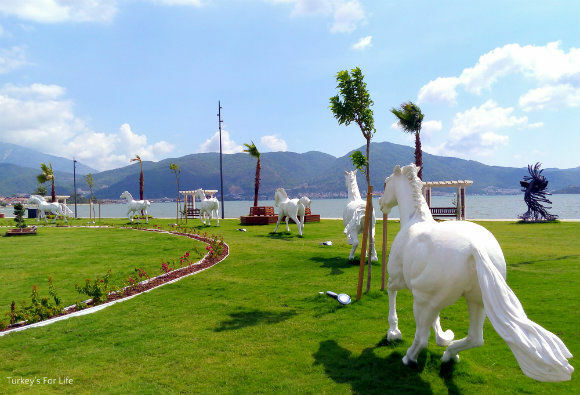 Bravo, Fethiye Belediyesi – we love this park. It’s a triumph! 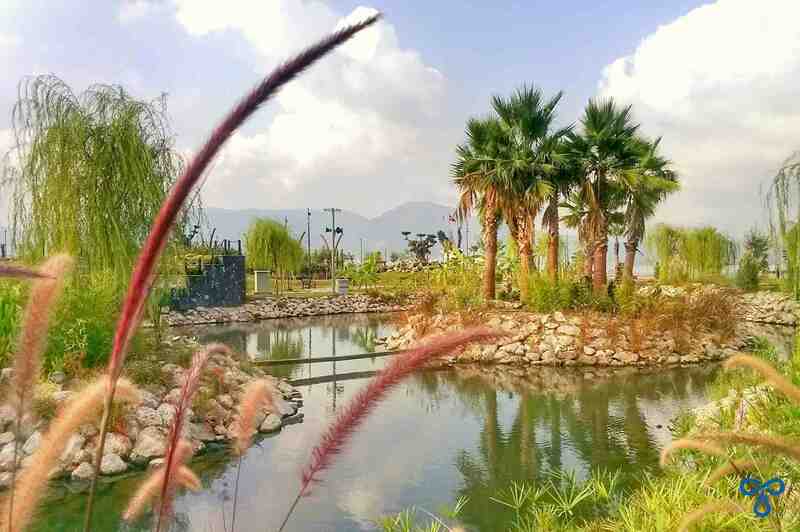 We love the green spaces – and Şehit Fethi Bey Park has no shortage of these. Numerous trees, yet to mature, are dotted all over the grassy areas and will provide welcome shade in the summer months. We all know how precious green spaces are in a world where concrete construction is rampant. 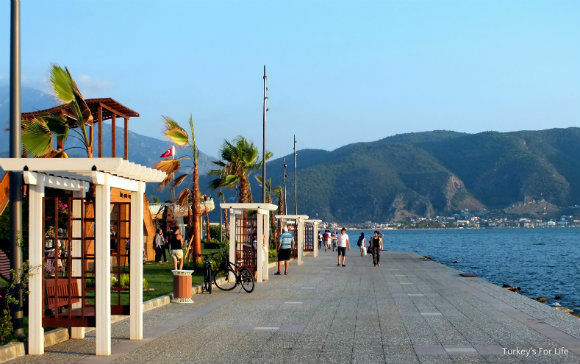 As well as Fethiye’s beaches and forest and mountain pathways, we now also have a pleasant chillout urban zone that also happens to be right by the sea. And happy days. 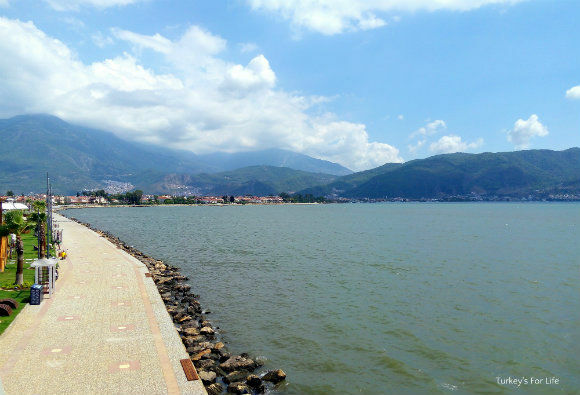 Fences, barriers, sludge and muddy mounds all removed and you can now choose your route as you walk along the sea between Fethiye centre and Çalış via Fethi Bey Park. If you want to, you can choose to stay along the harbour path hugging the sea. Lots of benches for a stop off, if you need a breather and there are even wooden boards right on the sea shore for those of you who like to sit even closer to the water. 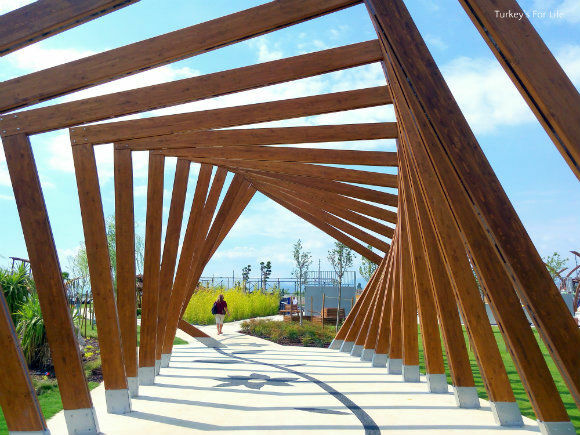 Or you can choose to walk through Fethi Bey Park, itself. This is going to be no boring stroll, you understand. Pathways are winding. You cross bridges, pass various interesting sculptures (we’ll get to those) and you’ll no doubt detour, too, as something else captures your eye. But, early days as it is, our favourite features of Şehit Fethi Bey Park are the tunnels that guide you through the pathways. The one in the photo above is just fantastic. We’d seen it being constructed weeks before and couldn’t wait to wander around under it – and take lots of photographs, too, of course. There’s something about a tunnel that makes you want to walk through to the other side. A perspective that leads the eye and draws the feet. And look how the sun shines through the awnings on the roof of this tunnel creating pretty geometric patterns on the pavement. Şehit Fethi Bey Park is not just a place for those who like a gentle stroll. If you prefer a bit more speedy activity, runners and power walkers now have the running track starting at the side of Boğaziçi Restaurant and going all along the harbour before going over the bridge and winding through the edge of the park. We’ve been so excited about this for such a long time and, at the time of writing, I have an annoying hamstring injury and can’t run for a while! Barry has already christened it and now loves his run to Çalış, through the park setting instead of along the main road. 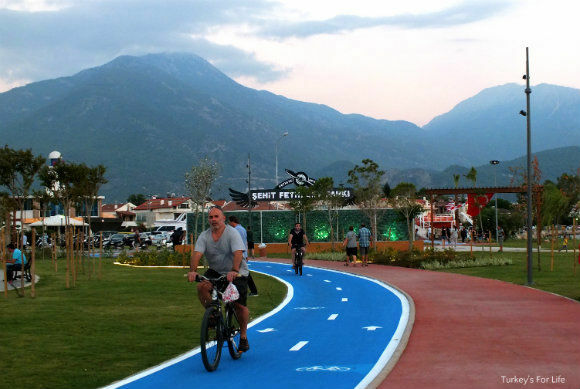 Cyclists, you get the winding cycle track and you can now cycle all the way from Fethiye centre to Çalış Beach along the cycle track, taking in Fethi Bey Park en route. Lovely. Not energetic enough for you? Park your bike up or stop running for a while and use the outdoor gym facilities in the park. Are we making Şehit Fethi Bey Park seem like an activity centre? Well, it is in a way. But it’s also a place where you can come and have a minute – watch the world go by and take time to reflect. This can be done in a few different ways. You can sit at the various benches around the park and the seafront. There are shaded pagodas surrounded by foliage to make you feel a bit more secluded. Or you can get even more relaxed. 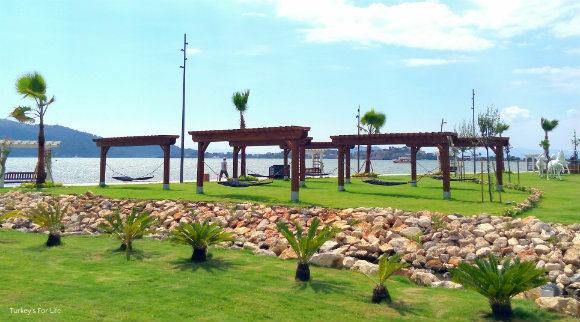 If you really want to kick back and relax, there are lots of these wooden loungers on the grass around Fethi Bey Park. You can’t tell from this photo but they are wide enough for two people. Yes, yes, of course we had to try them out! Can you see yourself swaying in the Mediterranean sea breeze on one of these hammocks? If those wooden loungers are not allowing you to get quite horizontal enough and you are using Fethi Bey Park as your chillout zone, surely a hammock is going to do the trick. No, we didn’t sample these yet…but we might do soon. If you’ve got kids, the kids’ zone at Şehit Fethi Bey Park is fantastic. There’s the usual swings and slides but there are also huge climbing areas. Walk through on a summer’s evening and these areas are buzzing with activity. Real family time. Whilst the younger kids can use the grassy areas and climbing zone, the older kids with bikes, skateboards and roller blades are also using the skate park. A basketball court adjoins the skate park, too. If you’ve been to the kids’ play area, you’ll know these photos don’t do it justice. But we can’t show you everything – you can go and see for yourself. 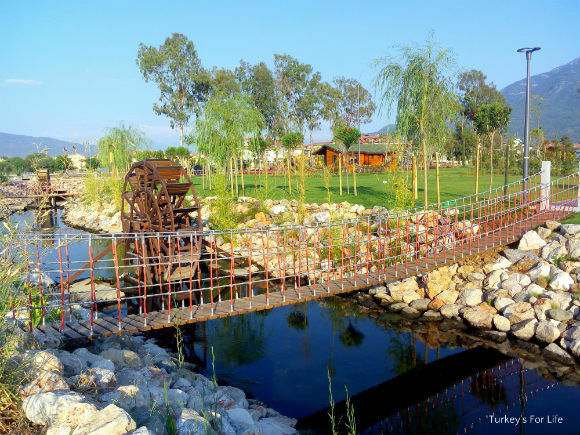 As well as the greenery, the kids’ areas, the tunnels and the cycle and running track, there’s also lots else to keep you occupied whike you walk through Şehit Fethi Bey Park. We’ve wandered through a few times now and still keep finding different pieces of art to stop and look at for a while. The horses are perhaps the most obvious additions to the park. You’re going to struggle not to see these; large, numerous and white as they are. But not all of the installations are as in your face and obvious as the horses (or perhaps it’s supposed to be just one horse in various stages of a run and jump), it’s these less obvious ones we like to take the time to stop and look at. This chap, for example, is fabulous. As you walk up the wooden-platformed slope of the rounded observation deck, you can see this sculpture in the centre on the grass below you. 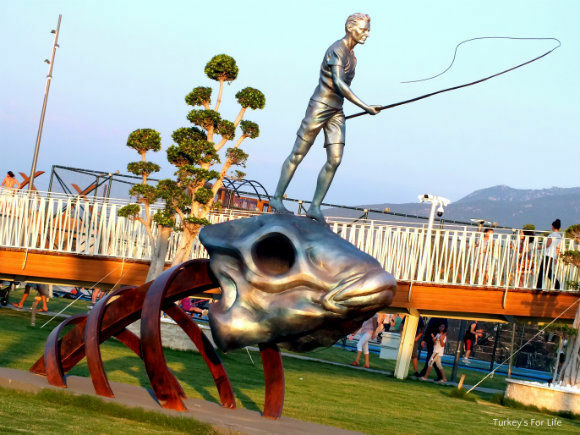 Amazing panoramic views over the bay of Fethiye on one side of the deck and art installations on the other. And what’s a park without a few water features, eh? The great thing about the water features at Şehit Fethi Bey Park is that they’re completely natural. By that, we mean the water is completely natural. This area of Fethiye was once all wetlands and reeds. Urbanisation put pay to that and wetlands are now villas, streets, schools, supermarkets and hospitals. Thankfully, there is still a protected area that is home to varied birdlife and, of course, Duck Island. As for the park, you can’t just bury water and pretend it’s not there! All around the park, canals have been created and the water channeled through them so that it has become a feature. The canals have rope bridges – some easier to cross than others – and glass-bottomed bridges where the water exits into the sea at the harbour. The focal point of the waterways is the Şehit Fethi Bey Park pond. Islets are home to more sculptures and there’s a seating area around part of the perimeter. Eventually, as the park settles into its skin, this pond and the rest of the waterways will no doubt become home to lots of wildlife – it looks like a frog haven, for starters! And that concludes our little tour of Fethiye’s Şehit Fethi Bey Parkı. We don’t want to spoil it for you by showing you everything. This is just a little taster, of course, and it’s the park through our eyes. When you do visit, you will be seeing it from your own perspective, your own angles and the aspects that caught our eye might not catch yours. 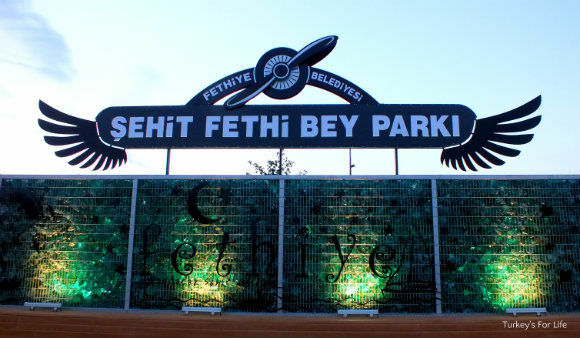 You can visit Şehit Fethi Bey Parkı and make it your own. Şehit Fethi Bey Parkı is at the end of Fethiye harbour, opposite the state hospital in Çalış. The park will be open year round and is free to enter. The Sahilden Fethiye to Çalış (and vice versa) dolmuş passes the park. If you are arriving by car, there are parking spaces in the park. People on bicycles who want to spend time in the park can lock bikes up at the bike parking stations. We really love Şehit Fethi Bey Parkı and feel it’s a great asset for Fethiye so we have added it to our Fethiye Must Sees & Dos page. Thank you so much for that walk and photos, it sure looks fantastic, cant wait to try all equipment and run and bike around. I am sure you will enjoy it and turkish residents and families will be spending a lot of time and energy there. Fantastic! It’s finally finished. And the park looks great. Thanks for the great photos. So does it basically connect Calis to Fethiye ? I know the harbour end but the hospital is ( seems) so far away from Fethiye and closer to Calis I can’t imagine it filling all of the space between? we are over in a few weeks and I really want t go but need to know which end to start at ! Hi Caroline, Şehit Fethi Bey Parkı fills the space that is in front of the state hospital, where they’ve been dumping all the rocks and soil for years. 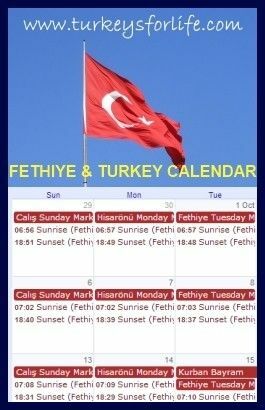 It is closer to Çalış than to Fethiye centre but Çalış IS Fethiye so it’s still part of Fethiye. 🙂 Çalış is just the name of a Fethiye resort. Merhaba, getting my suitcase ready, will arrive Saturday night. Could you please tell me if bike locks and helmets can be rented when I rent a bike for the month? 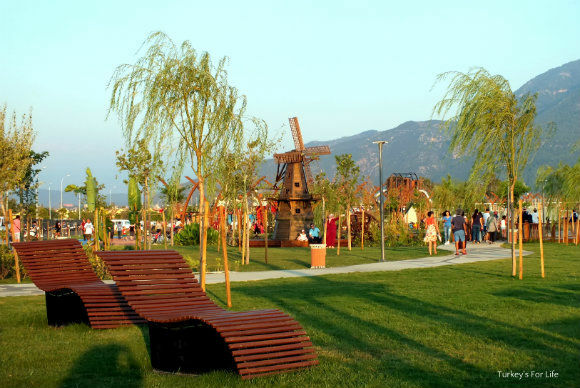 Will be staying at Dove Ap close to this park and will rent a bike to travel to Fethiye and around Çalis. No need to apologise, Suzanne. And the bike track goes right through the Şehit Fethi Bey Park. 🙂 Not sure about helmets and locks, sorry. Although I’m sure you’ve found out by now. Apologies for taking so long to reply to this. great photos, but they dont fully do justice to the real thing, and how big it is. its a fantastic area now, we couldnt believe the changes to the area in only two or three years since our last visit. what was a bit of a run down area is now bright and modern, there has been so much work done to improve the area overall, it is a nice surprise to see how it has developed.